War, by its very nature, is a destructive force. And the magnificence of an ancient building, one whose history was forged over centuries, can vanish with the push of a button or the squeeze of a trigger. This list highlights 10 historically and culturally significant sites lost to the ravages of war, some as recently as 2013. During the Bosnian War of the ’90s, Banja Luka, Bosnia’s second-largest city, saw heavy fighting. One of the most remarkable structures in the city was the Ferhat Pasha Mosque, an exceptional example of 16th-century Islamic and Ottoman architecture. In the early hours of May 7, 1993, Serbian forces of the Republika Srpska rigged the Ferhat Mosque and surrounding structures with large quantities of explosives. The mosque was razed to the ground, and the debris was carted away and used for land fill. Following the war, former Serb leader Radoslav Brdjanin was convicted for his part in the demolition of the complex, along with larger war crimes. He was sentenced to 32 years in prison. In more recent years, extensive reconstruction work has been carried out on the surviving foundations. 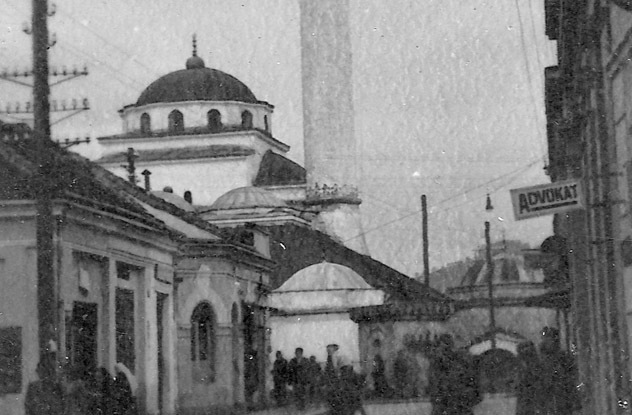 Both the Ferhat Pasha Mosque and its independent minaret are now well into the stages of restoration. 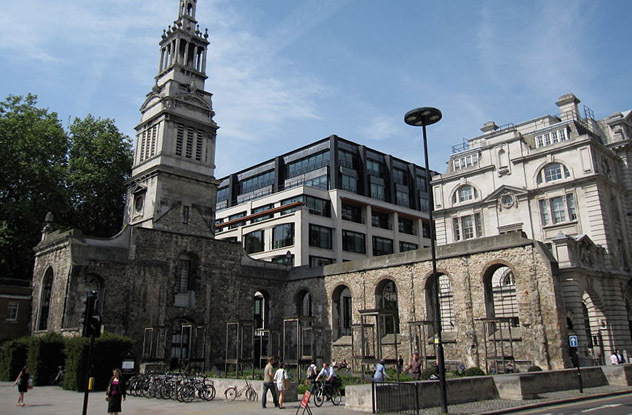 Sir Christopher Wren built Christ Church Greyfriars in London to replace a medieval church lost during the Great Fire of 1666. His design was simple. The church’s exterior was decorated with traditional neoclassical gables, while the interior boasted marble floors. Beautifully decorated Corinthian columns separated the nave from the aisles. Large, arched windows filled with clear glass allowed the church to be brightly lit, giving the interior a warm and welcoming glow. During World War II, London became a major target for German bombing. 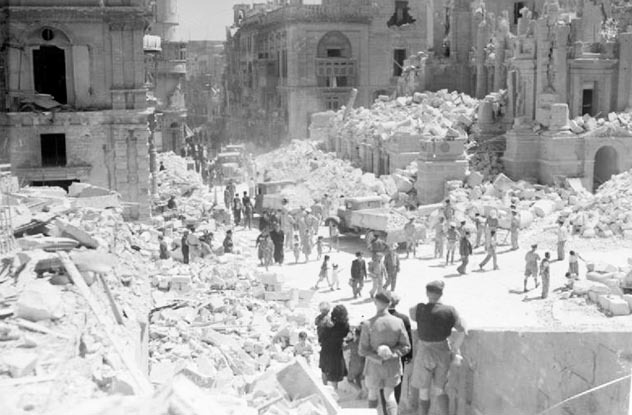 The Blitz decimated large areas of the city, and the bombing’s indiscriminate nature destroyed many sites of no strategic value as targets—including Christ Church Greyfriars. On December 29, 1940, a firebomb hit the top of the church, tearing through the building and igniting the interior. The resulting inferno caused the vaulted roof to collapse, destroying the building and its contents. The only item to be saved was an ornately carved wooden cover for the baptismal font. It can now be seen in the foyer of the nearby St. Sepulchre’s Parish Church. Apamea, the ancient “Treasure City,” sits on the bank of Syria’s Orontes River. It was once home to the kings of the Seleucid Empire, and it later housed the Romans, growing to a population of 500,000. More than a millennium later, it rose again, now as a base during the Crusades. Its magnificent paved streets, beautiful mosaics, and bright white columns carved with intricate designs were a sight to behold. Its long history made it one of the Middle East’s most important archaeological sites. During the current conflict in Syria, Apamea has been damaged to such an extent that many historians believe it can never be restored. Not only has Apamea been devastated by bombing, there have also been those who have taken advantage of the chaos by ransacking the ancient city, looting its treasures. The site now lies ravaged, its columns broken and its mosaics smashed. The Old Summer Palace, also known as Yuan Ming Yuan, was a complex of gardens and buildings in Beijing constructed in the 18th century. The palace itself served as a base of operations for Qing Dynasty emperors to live and handle government affairs, while its grounds were filled with examples of beautiful architecture, which included magnificent temples, pavilions, and bridges adorned with ornate Chinese designs. The surrounding gardens were equally impressive, with lush green lawns and exotic flowers growing around serene ponds and rivers. In 1860, at the climax of the First Opium War, a French and British expeditionary force occupied Beijing and discovered the palace. Although the Emperor had fled, most of the palace’s contents had been left behind. Meeting little resistance, the troops looted the complex of its riches. The British High Commissioner to China, Lord Elgin, then ordered the destruction of the palace in retaliation for the torture of British and Indian troops. 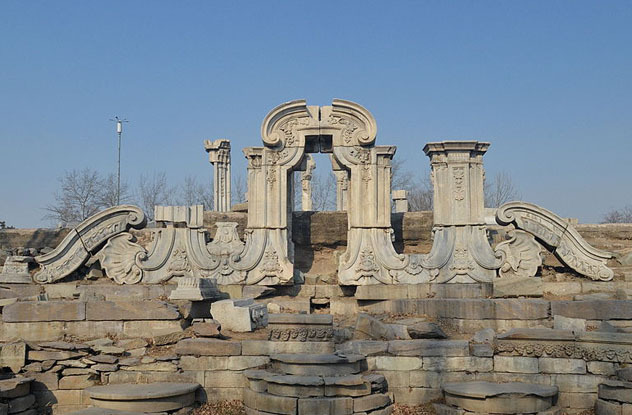 Although its magnificent buildings are now lost forever, the site of The Old Summer Palace still attracts thousands of visitors each year. Timbuktu, known as the “City of 333 Saints” for its religious history, is located in Mali, on the edge of the Sahara desert. Founded in the 12th century by nomads, the town soon became a major trading hub for the caravans that braved the treacherous Saharan dunes. The city is steeped in history and features several remarkable and historical structures unique to the area. Ancient stone mausoleums housing the remains of Muslim holy men are scattered throughout the town, along with shrines dedicated to the memory of revered saints and religious figures, some dating back centuries. Recently, Timbuktu has become a target for extremist Islamist factions bent on spreading their fanatical ideology. In 2012, members of a group with links to Al-Qaeda began destroying the famed ancient sites. More than half of the town’s centuries-old shrines and mausoleums were torn down and reduced to rubble, including that of revered Muslim scholar Sidi Mahmoud. The desecration of these sites has been met with international outrage. Calls for an end to their destruction have fallen on deaf ears, and they remain at great risk. 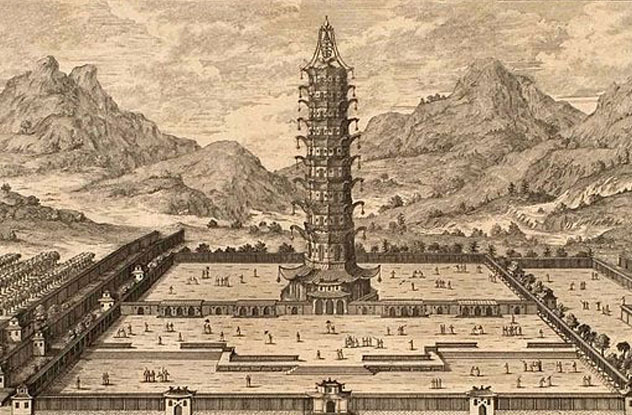 Standing almost 80 meters (260 ft) tall, the Porcelain Tower of Nanjing must have been an amazing sight. Hung with 140 lamps, its eight sides were beautifully decorated with images of the Buddha, and its nine interior levels boasted a vast array of religious carvings and statues. It is said that on a sunny day, light would reflect off the sides of the tower and give it an ethereal glow. In 1801, lightning struck the tower, causing three sections to collapse. However, it would be almost 50 years before the Porcelain Tower met its ultimate fate. In 1850, civil war broke out in southern China, and the conflict soon spread to Nanjing. Concerned that the enemy could use it as a lookout point, rebel forces occupying the surrounding area decided to demolish the tower. Its crumbling remains were left where they fell, the porcelain bricks that once shone so magnificently reduced to a depressing pile of scorched rubble. The remains of the tower were later repurposed for use in the construction of other buildings, although some sections were saved and are now on display in the Nanjing Museum. On a positive note, in 2010, a Chinese businessman donated a staggering one billion Yuan to the Nanjing government to fund the reconstruction of the tower. Although the original is now lost forever, it is hoped that the new building will capture some of the majesty of the Porcelain Tower. 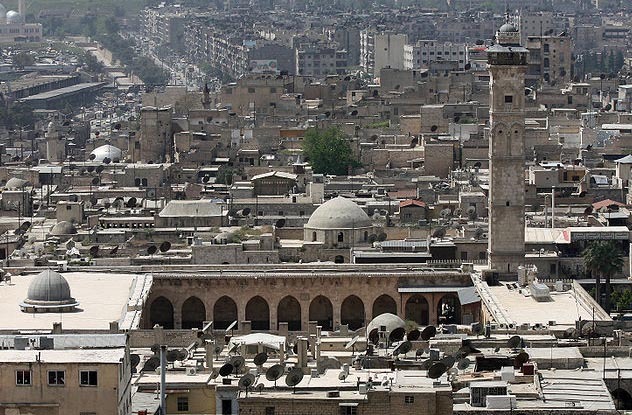 Aleppo’s Great Mosque is located within the city’s historic Al-Jalloum district. The largest of its kind in the area, the mosque supposedly houses the remains of Zechariah, father of John the Baptist. Because of its historical importance, the complex is recognized as being a UNESCO World Heritage site. After enduring earthquakes and numerous conflicts, the mosque eventually met its end in April 2013. The building had been occupied by rebel forces for several months, and it became the focal point of brutal gun battles. Following an intense clash between Syrian rebels and government forces, heavy gunfire reduced much of the site to rubble, including the 11th-century minaret that towered over the mosque. Historians have described the mosque as a “living sanctuary” and are horrified by the destruction of a place so historically significant. 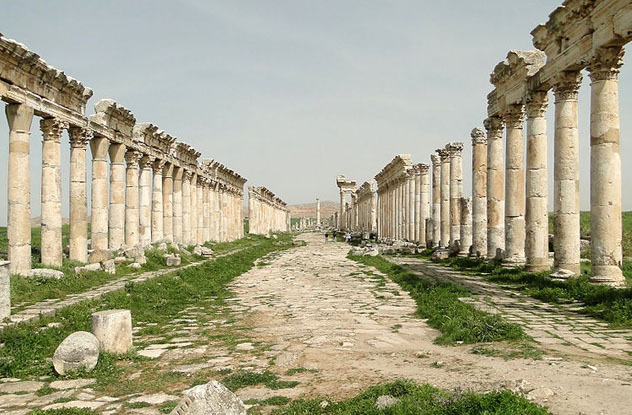 Although the possibility of reconstruction does exist, as with Apamea, the ongoing situation within Syria prevents any restoration from now taking place. Pyongyang’s Yongmyong Buddhist temple was built over 1,500 years ago and was named for an ancient king, Dongmyeong of Goguryeo. According to legend, a chambermaid of the queen was struck by lightning and shortly after gave birth to Dongmyeong. The king, fearful of this supernatural event, threw the young child into a pigsty. The child survived, and the king, taking this as an act of divine intervention, changed his mind and ordered the queen to raise the boy. Famed for its beautiful scenery and gardens filled with cherry trees, the temple was a popular tourist attraction in its day. It underwent several alterations throughout its life, including extensive restoration work carried out in 1920. 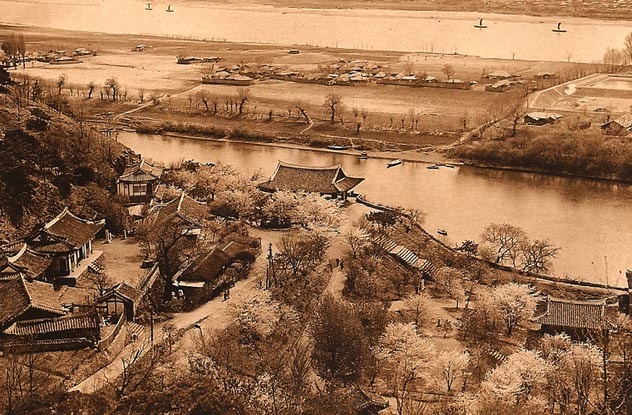 The US destroyed the Yongmyong Temple in a carpet bombing attack during the Korean War. One area of the temple, the Pubyok pavilion, was rebuilt shortly after the war and is now registered as a national treasure of North Korea. Housed within Baghdad’s National Library was an immense collection of 12 million books, manuscripts, and carved stone tablets detailing the nation’s long history. In 2003, the Library and Archive came under attack by Saddam Hussein’s loyalists, who were intent on destroying records of the Ba’athist regime. They deployed petrol bombs and other incendiary devices throughout the building. The fire consumed much of the library’s collection, and then looters had their way with what remained. The destruction of these documents is not just a great historical loss, but a huge loss to Iraq’s cultural heritage. And although an effort to compile and restore the remaining documents is currently ongoing, those lost during the fire remain irreplaceable. Designed by renowned British architect Edward Barry and completed in 1866 following four years of construction, the Royal Opera House once stood proudly on the corner of Strada Reale in the historic city of Valletta. Now covered in restaurants and boutiques, Strada Reale shows little evidence that it once played host to one of Malta’s most magnificent examples of neo-classical architecture. Only a few columns and a terrace now remain as evidence of its existence. The Royal Opera House had quite a turbulent history. On May 25, 1873, a fire broke out inside the building and destroyed much of its extravagantly designed interior. Reconstruction work was carried out almost immediately, and the theatre reopened its doors four years later to Giuseppe Verdi’s Aida. But in the following century, the Royal Opera House became an unsuspecting victim of the German Luftwaffe. A single air raid on April 7, 1942 left the magnificent building in ruins. James Fawcett is a freelance writer and photographer from Durham, UK.